My husband's appetite is really insatiable. He likes to eat almost everything edible. He has more cravings than I do and satisfying each one has become my "agony" during cooking time (not complaining though :-) I like challenges). For sometime now (actually every time we buy squid) he'd been requesting for fried calamari. The thing about cooking fried calamari is that it is laborious. Even if I use the frozen sliced squids available at most supermarkets, I find the preparation very tedious and messy. Imagine dredging each slice of squid with flour, dipping them one by one in beaten egg, then coating each one with spice and flour mixture, then frying the squid. But since my husband persistently and sometimes annoyingly begs me to cook fried calamari, I did obligingly. Calamari is an Italian plural word for squid, calamaro is used for the singular term. In most parts of the world, calamari is used to describe squid that is used for food (source: www.merriam-webster.com ) Fried calamari is a dish that is considered part of the Mediterranean cuisine that is embraced by most cultures world wide. 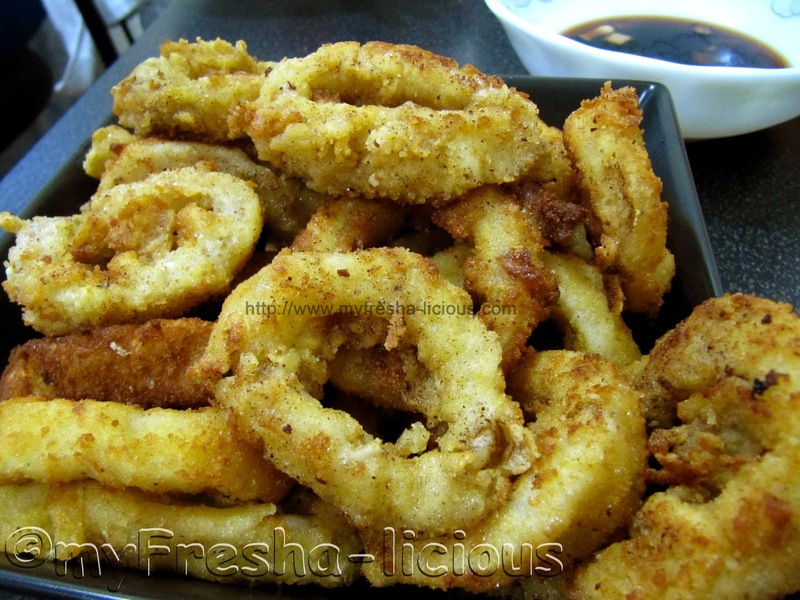 Fried calamari is basically consists of deep-fried, batter-coated squid and served either plain or comes with dips. The batter-coated squids are fried for just a few minutes (at most 2 minutes) to prevent the meat from toughening. Like any other dish that was adapted worldwide, each culture has come up with their own version of fried calamari. This version of mine is simple. You can serve it with your favorite dip. My husband preferred dipping his fried calamari in my cucumber-vinegar dip. I like mine with my mayo-garlic dip. See the recipes for the dip below. 1. Place the sliced squid in a large mixing bowl. Sprinkle with salt and pepper. Mix thoroughly using your hands. Let sit for at least 30 minutes. 2. In separate containers, place the flour in one and the breadcrumbs in another. Beat the eggs and put it in another container. 4. Dip the squids in the beaten eggs. 5. Roll squids over the breadcrumbs. 6. Heat the cooking oil in a deep pan or small pot.